In this clip Patrick Henry, the CEO of GroGuru talks with Dr. Jeff Campbell, GroGuru’s Chief Science Officer. In this video, they are talking about technology. They discuss all the things related to GroGuru’s sensor technology and the information that we can get out of the ground to farmers to help them with their irrigation recommendations. Watch this video to learn more about what SWAT certification is, and how GroGuru’s sensors have passed the certification. Patrick: Tell us about the GroGuru sensor. What exactly does it do? 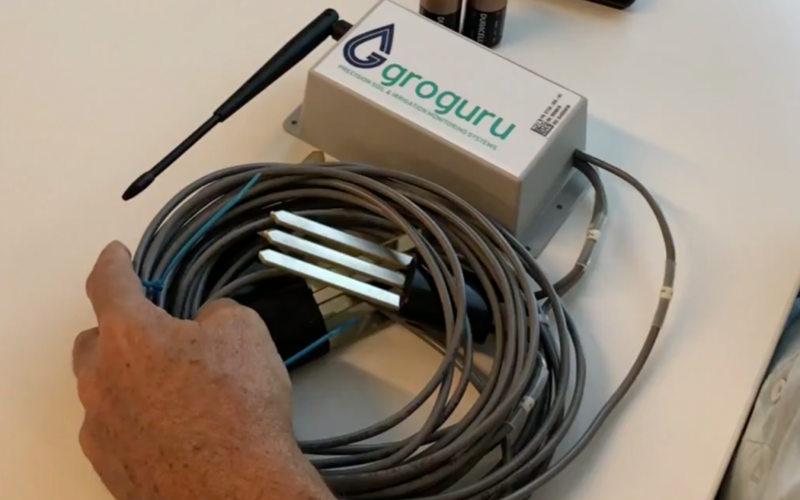 Jeff: The GroGuru sensor measures soil moisture, salinity and temperature, which can be used to efficiently irrigate, manage salinity and improve crop yields, while at the same time, improving your stewardship of the land and the fertility of your soil. Patrick: The GroGuru sensor has passed SWAT Certification. What exactly does that mean? Jeff: SWAT is the Smart Water Agricultural Technologies group. They are a third-party evaluator of irrigation technology. Our sensor was submitted for an extensive validation. It’s a months-long process where the sensor is examined under salinity conditions, a wide range of temperatures and soil types as well as wetted and dry cycles. This is to make sure that the sensor is capable of giving the information that’s needed for managing irrigation. Patrick: It’s about robustness over a period of time while still staying accurate. Jeff: Yes. It’s designed to test under realistic field conditions. If the sensor stands up under SWAT’s testing, it should survive in the very complex environments that it will be subjected to in agriculture. If you are a grower and believe the GroGuru solution could be right for your crop or field, please do not hesitate to reach out and see how our solution can work for you!